Start by creating a new “Windows Metro style/Application”. 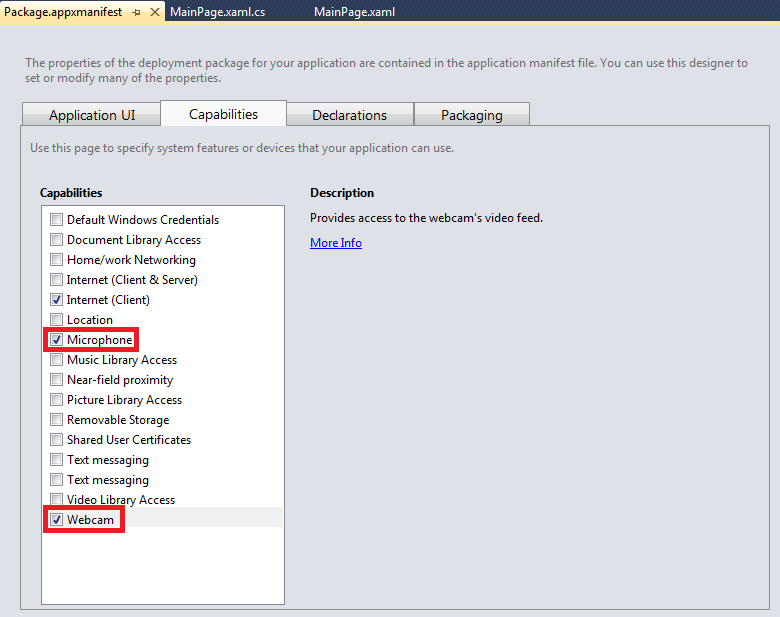 Then enable access to webcam and microphone in Package.appxmanifest. If you skip this step – you will do all the coding only to get a black screen instead of your mug when you are done and start your app. Then you might start wondering – is my webcam dead? Problems with WinRT preview? Well, no – it is just how Windows 8 handles these missing capability declarations – no error, just no output. If all you want to do is record the output from the camera or see what it can see – you can use the built in CameraCaptureUI dialog. It allows you to capture an image or a video and it has built in controls for camera settings (resolution, device, stabilization, brightness, contrast, flicker compensation, focus and exposure). It will even allow you to crop the image when you take it. You can use the CaptureElement in conjunction with MediaCapture to embed the video preview inside of your application and get more control of the video stream. Using the VideoDeviceController property of MediaCapture you can control all the basic video settings of the CameraCaptureUI. You can also flip or rotate the image, add image stabilization or any other effect (assuming you know how to implement IMediaPlugin). The one thing I could not figure out was how to release the webcam input, so after I used the MediaCapture once – I could not do it again or use the CameraCaptureUI. Maybe a problem with the API or just a problem with documentation. 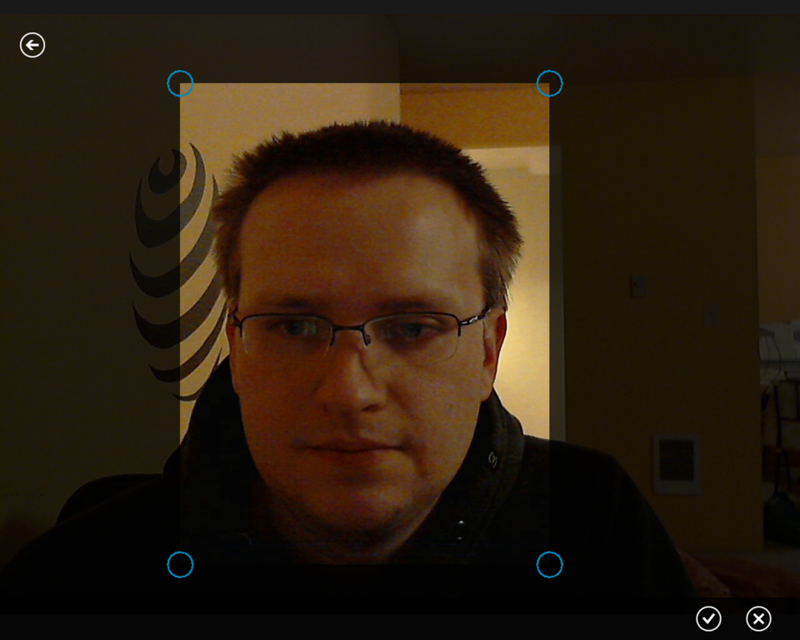 A good way to inetgrate the camera in a WP7 app. Any idea how to apply a filter to the stream? 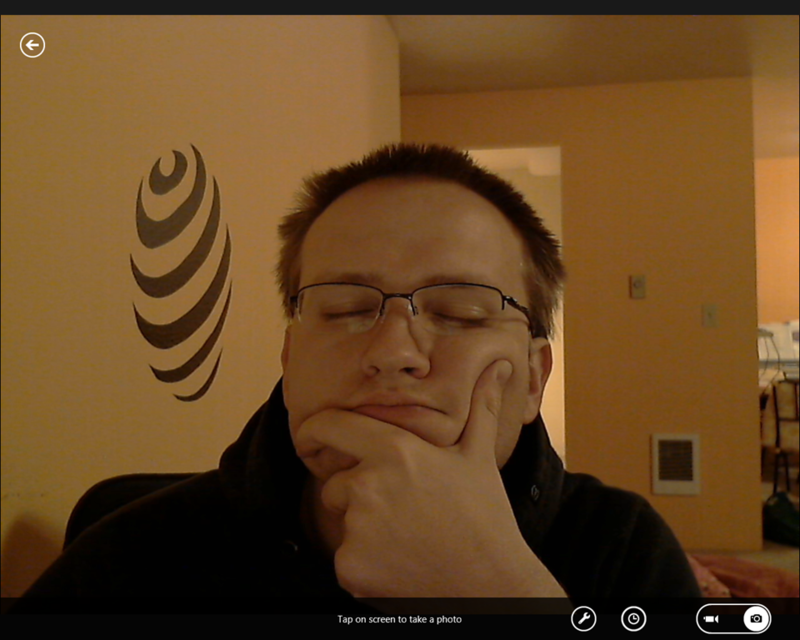 I wrote a WPF app that used Pixel Shaders to apply a filter to a webcam stream, but since Metro doesn’t support Pixel Shaders I’m running into issues. Basically you need to either do the filtering on the CPU or transfer the video frame by frame onto a Direct3D surface and apply shading on it there. @xyzzer, great post… the reason you are not able to start up the video again is because of the call to InitializeAsync(). Try doing something like this in your capture function. I think this must have been something else. I was doing this on the Developer Preview build of Win8 and I tried many different things. The implementation in WinRT XAML Toolkit (http://winrtxamltoolkit.codeplex.com/) seems to work fine. Dear xyzzer, I am being stuck with the following http://stackoverflow.com/questions/12836017/perform-live-video-stream-processing-from-captureelement-mediacapture after reading your blog. Not sure you are willing to provide some valuable feedback? Thanks. how to save the image captured inn picture library?? please help me out, i am making a metro app in which i need to capture an image and then save it in picture library and my deadlines are very near and i know how to capture and display it in image control but no idea of how to save it in picture library?? It will crash when switch camera frequently when use CameraCaptureControl . 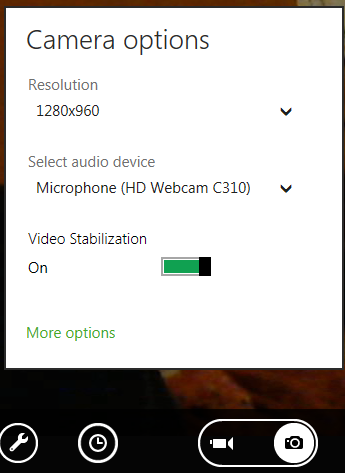 Kindly help me out, how to access back camera like web cam or front camera of Surface Device. The panel part of device.EnclosureLocation.Panel if not null – specifies which panel the device is located on. See Windows.Devices.Enumeration.Panel for all options. You can check the CameraCaptureControl code here for reference for how to do some things you might also need. Can I use this to capture video from my external wifi ip camera? That’s a good question. I’ve never even heard of such a thing, but it would be interesting to find out. Does your external camera show up in the standard CameraCaptureUI? Does it show up in Skype?